This is the first event in a series of informative discussions geared towards building community and gather knowledge about current topics in Portland…while we eat burgers in our lovely back patio. You’re invited for burgers and brews. Wednesday August 27th at 5:30pm. 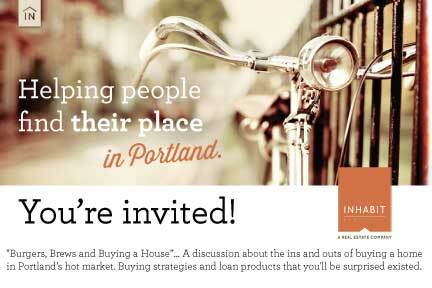 A free informative discussion on navigating Portland’s housing market. A sharp and informative homebuyer discussion chocked full of real world knowledge, financial insight, and confidence building information. 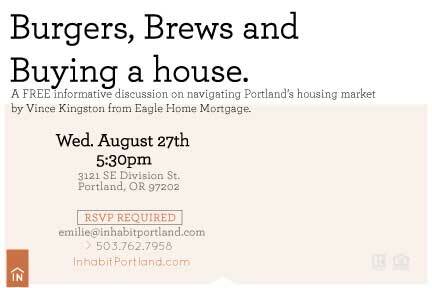 You’ll learn about Portland homebuyer programs, tax credits, how to shop strategically, as well as financial insights of homeownership. Vince Kingston is a local mortgage advisor in Portland, Oregon with Eagle Home Mortgage. Vince is a Portland Housing Center certified lending partner and one of the few area loan officers able to offer the full suite of first time homebuyer financing and tax credit opportunities including the MCC first time homebuyer tax credit, Oregon Bond loan, MAP 80 100% financing, 203K rehab financing, and more. Vince has worked as a first time homebuyer advocate by offering first time homebuyer opportunities many local lenders are unable to offer. You won’t find a loan officer more dedicated to meeting the needs of first time homebuyers.